So you listened to episode 58 and you’re convinced of the benefits of outdoor play. But you’re a grown-up. You don’t play outdoors. And you don’t know anything about nature. How can you possibly get started in helping your child to play outdoors more? There are a number of books out there on getting outside with children – some arguably more well-known than this one, but I have to say that Dr. Scott Sampson’s book How to Raise a Wild Child is the BEST book I’ve seen on this topic because it balances just the right amount of information on why it’s important to get outside, with just enough pointers on how to do it, without overwhelming you with hundreds of options to choose between. And it turns out that you don’t need to know a thing at all about The Environment to have a successful outing with children! If you’ve been wishing you could get outdoors more but just don’t know where to start, then this episode – and book! – are for you. Gopnik, A. (2009). The philosophical baby: What children’s minds tell us about truth, love, and the meaning of life. New York, NY: Picador. Young, J., Haas, E., & McGown, E. (2010). Coyote’s guide to connecting with nature. OWLink Media. Jen: 00:38 Hello and welcome to the Your Parenting Mojo podcast. For those of you who get my fortnightly newsletter, which you can receive by subscribing to the show YourParentingMojo.com, you know that I have a bit of a penchant for the outdoors. I went on a 10 day backpacking trip across North Cascades National Park in September, and I’m trying to pass on my love of the outdoors to my daughter, most of our newsletters have a photo at the top and pretty often they go out with an image of her sitting in a stream or clambering over boulders or up to her thighs and a pond wearing waders, of course. 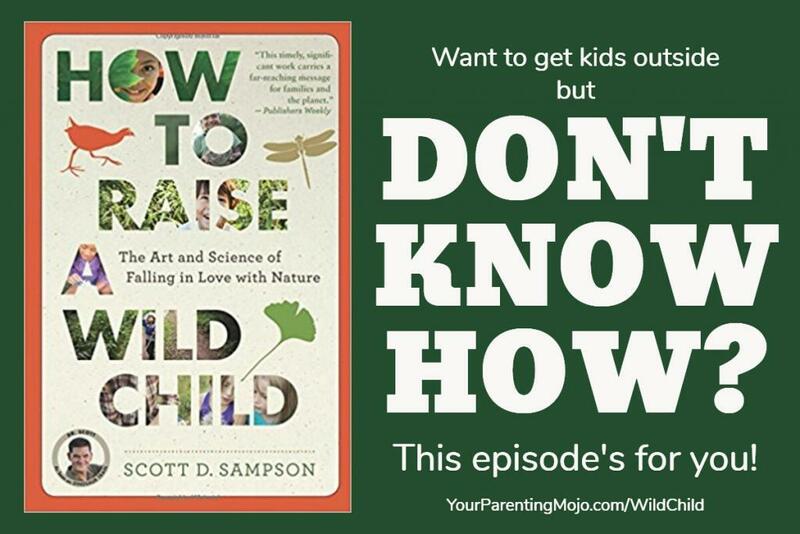 And so today we’re going to talk with Dr Scott Sampson, the author of how to raise a wild child, the art and science of falling in love with nature, which I have to say is the best book I’ve read on this topic in terms of balancing information about the science of children in nature with a not overwhelming number of actions that parents can take to raise a wild child. Dr Sampson has the honor of being the first paleontologist we’ve interviewed on this show. He earned both his master’s in anthropology and a phd in zoology from the University of Toronto. He’s currently the president and CEO of Science World British Columbia, which is a pretty cool hands on science museum in Vancouver. And if his name sounds familiar to the parents of preschoolers, it’s because he also hosts the PBS kids series dinosaur train. I’m so excited to discuss this topic that’s so close to my heart. Welcome Dr Sampson. Dr. Sampson: 01:56 Thank you very much, Jen. Nice to be honest. Jen: 01:58 All right, so let’s start with the science. You and your book site a raft of studies describing the really profound shift in children’s leisure time. That’s happened over the last 50 years or so. Can you briefly, if possible, summarize 50 years worth of literature and why does it matter that our children don’t spend as much time outside now as they used to? Dr. Sampson: 02:18 Oh, let’s start with the first question and then we’ll go to the second one on the reason why this is important, so I wrote How to Raise a Wild Child because after doing a lot of thinking and research and talking with people, it just became clear to me that there was this dire need to reconnect kids with nature that over a single generation we’d gone from basically a free range childhood to an indoor migration that has limited children’s ability to be outside and the end result of this has been a health crisis for children and the places that they live. That one US surgeon general said not so long ago that this generation of children could be the first to have a life expectancy is shorter than that of their parents. We have these runaway conditions, obesity, attention deficit disorder, diabetes, depression, even conditions like Myopia and not only is the incidents of these conditions increasing, but they’re moving earlier and earlier into childhood and so that’s the health of children and then when you think about sustainability and moving towards, you know, a thriving green future, the reality is why would we ever become sustainable if we don’t care about where we live and why would we care if we never spend any time outside. A screen looks the same in Vancouver or Miami or Timbuktu as anywhere else. Dr. Sampson: 03:42 So we have this need to reconnect kids with nature and bringing back these childhoods that had a lot of green time instead of just the screen time that we’re getting today. So that is the why. Then going to the science – in reading about this, I was struck that this nature connection was this pressing issue. So I said, well, “where’s the research on this?” It turns out there’s a lot. Most of it is actually over the past 15 years since this has become a real issue, sort of 15 to 20, but there is a lot of scientific literature and it’s growing every week, but as I looked around I saw that there was no general audience book that had put this information together and summarized it for parents and teachers and other caregivers. So that’s what I attempted to do with How to Raise a Wild Child. Jen: 04:34 Yeah, and it was really that balance of what does the research say plus the practicality that spoke to me in the books very well. We’ll get more to the practicality in a minute, but I want to touch on something that you mentioned there about people caring about where they live and I had been doing a lot of thinking as I’m doing a masters in education at the moment and in the course of doing that, I’ve been thinking about place-based learning and the idea that you couldn’t really care about a place where you spend time outside if you do engage in outdoor-based activities and it was just thinking about things like the decline of rural towns where people move away from them because they don’t have any job opportunities there because the children are told they have to go to college to be successful and so they move away and then they don’t want to come back. And you know, there aren’t any companies there with viable jobs. And so I realized this is a bit off topic here, but what I realized is that really having this connection to a place can be an enormous factor in saving these small towns. The idea that getting to know a place intimately and learning about it both in school and in life, do you see that same connection? Dr. Sampson: 05:40 I absolutely do, and you hit on a topic about which I am deeply passionate. In fact, I’ve begun work on a book about place based learning and so I think that it is one of the major directions and education to move in that right now, the primary model of education – of course there’s a great diversity of education types out there, but the primary model, that sort of industrial model of education is really all about standardization. It’s about standardized testing. It’s about everybody being evaluated across the board in the same way and when you think about that, it’s the antithesis of place-based education and it makes sense that place based education would struggle to gain a foothold within a system like this because everything that’s taught in school works against a specific knowledge of place, and it’s all about knowing these general things that you can regurgitate on a test and yes, there’s a lot of evidence to back up the fact that learning real, true engaged learning, is best when it is hands on. Dr. Sampson: 06:50 This experiential and the place that we have these experiences is where we live. So right now the average kid leaves school at the end of the day and they don’t see anything that they’ve learned in the environment that they spend most of their lives in. Whether it’s science or art or social studies or you name it. They don’t really see that in place because they’re learning these topics from textbooks. They’re learning about how these topics affect faraway places, not their own place. So the notion of place-based education. People like David Sobel have really documented and written about the potential power of this kind of learning to deeply engage children and in particular, I think for me it comes down almost to one word and that word is wonder. All children are born with this deep sense of wonder and all you have to do is watch a baby crawling around to get it, but all children have this and by the time they’re six, most kids still have it intact, but by the time they get to be about 11 or 12 for many children, that sense of wonder is diminished and in some cases virtually gone and certainly by the teen years, learning is kind of a drag and that sense of wonder just isn’t there for the most part, at least when it comes to education. Dr. Sampson: 08:12 So our challenge as as educators and communicators of knowledge is to foster – kindle, that sense of wonder and then keep it kindled, keep it burning. And if we do that, then we’ve given children this gift because they’ll want to learn the rest of their lives. Jen: 08:29 Yeah. You’re reminding me of something that Professor Alison Gopnik talks about, which is how children’s attention is like a lantern and it illuminates everything around them, which is why they find this great sense of wonder and they’re also so easily distracted, but adults’ attention is more like a spotlight that shines on one thing at a time, which is why we can engage in goal directed behavior that children struggle with and in your book you argue that lantern attention isn’t just a stage that children have to get through before they come these sophisticated spotlights, but actually lantern attention is really valuable in and of itself and the adults would do well to try it too. Can you tell us some more about that? Dr. Sampson: 09:10 Sure; I think we have come to weight that spotlight of attention and see that as critical because that’s what we use to read or look at screens or focus on any one thing, but that kind of lantern attention was critical for the vast majority of the 200 to 300,000 years that humans have been around. If you’re a hunter gatherer and you’re out somewhere hunting or trying to not be hunted yourself, you had better have that lantern attention on where you are aware of your surroundings, you know, how to open your senses and take the world and we have lost that to a great extent at our children are losing it too and so it’s the whole notion of almost relearning how to hear, how to feel, how to sense the environment around you and we all know that being outside has a different impact on us emotionally and on our sensory abilities, but we have to develop those skills over time and our brains, as you well know, are very malleable when we’re babies, but we tend to lay down pathways based on our experience and if our experience has only looking at screens then those are the types of things that will be laid down our brains and we won’t have those abilities, those sensory, those lantern like abilities and it turns out that those are critical for even relaxation and just general health and there’s lots of, you know, kids aside for the moment. There’s lots of scientific evidence that being outside in nature is critical for adult health as well. The Japanese, you know this very well, they have something called “shinrin-roku,” where they send employees out to these amazing forests to do something which translates as forest bathing, which is a wonderful concept and the employers do it because the health of their employees increases if they do this and therefore they’re not spending as much on healthcare for their employees. So it is something that children and adults absolutely need. Jen: 11:09 And so what is it that people do in nature that makes this so beneficial to us? Is it, can we just walk around and not think about anything and get a benefit or do we have to think, oh wow, this is amazingly beautiful. Or do we notice specific things or what kind of processes are going on in the brain when we do this? Dr. Sampson: 11:27 Oh, of course. What happens in the brain is very specific to individuals and mostly dependent on their experience. I’ve been to a tropical rain forest in Madagascar, and I’ve been with somebody who is from that area, born and raised looking for Lemurs and I’ve spent half a day looking for lemurs and found nothing and this person can take me out and in 10 minutes we’re looking at lemurs and it’s because he knows that place. He hears things, he can see signals and signs, so his experience allows him to understand and interact with that place in ways that I can’t even begin to understand. So what we do know is that our bodies, our heart rate slows down, our blood pressure drops when we’re outside, we breathe in these things, particularly in the forest it appears, that make us healthier, that allow us to focus better, to concentrate for longer, to regenerate ourselves. All of this, and it turns out that kids to have some of these effects and more that they’re more likely to play longer, to fight less, to collaborate more when they’re playing outside, especially in a nature based setting than in other kinds of indoor settings or even in standard metal and plastic playgrounds. Jen: 12:52 Yeah, you reminded me a lot of Jon Young’s fabulous book Coyotes Guide to Connecting with Nature and I think that was a big inspiration for you as well and one of the key take homes from that book is the idea of developing a sit spot. And so I think a sit spot is a place where you go and you just sit and observe and I have to say I haven’t tried it yet because our garden is an absolute disaster and pretty much all I hear from the inside is Steller’s Jays and I see the hummingbirds and our hummingbird feeder out the window and I’m assuming I’m going to hear and see if those same things when I go out there. So I’m wondering, and I guess this sort of goes to the larger issue of I live in a city and a lot of people live in cities and is there something that people who live in cities can do to kind of cultivate this mindful awareness of nature, even though our experience and what we see might not be as pure as the forest bathers’? Dr. Sampson: 13:48 Absolutely. Nature is everywhere. Including in cities, including in underserved communities, although it is often less common there and therefore more difficult to find and there’s things we can do about that and I’m happy to chat about that too, but to address your question, Jon Young’s notion of sit spot is a powerful one because it is actually a discipline that you can use to help reconnect with where you live and I have done this off and on for years. I have done it in urban settings and found it to be powerful and the notion is really simple. You just go and you sit outside for a minimum of he suggests 15 to 20 minutes and it will take usually a few minutes for the place to settle down and for the birds to sort of get active again because whether we know it or not, the birds are always watching us. They’re always watching everything that’s going on because their lives depend on it. Dr. Sampson: 14:45 When we walk outside, we’re not worried about being attacked. Birds have to worry about this all the time. It appears that they’re flying around randomly, but birds don’t do anything randomly or if they do, they don’t last very long and so when they sing and they have multiple different calls and Jon Young encourages us to get to know the different calls of different species. After a while you will get to know the individual birds that live around your backyard because it turns out, of course most of these birds have territories and so you’re interacting with the same birds all the time and trust me, they know the individual cats in the neighborhood too because those cats are the biggest and most common predators on these birds, so just forming a sit spot practice where you’re outside on a daily basis for 20 minutes. First off, it will be healthier for you second and allows you to attune to whatever nature is there, and it might not just be birds. Dr. Sampson: 15:41 It could be insects. It could be mammals squirrels going around, but just after a while you will start to see things that on the first few days or even a few weeks, you did not see it all. Your senses didn’t even pick them up, but just by being there, all of a sudden you’re going, okay, I get this. First this happens, then this happens, you’ll recognize the kind of call that something is and you’ll say there’s a predator nearby. You might never see it at the birds will tell you that there is some kind of predator in the vicinity because they have an alarm call. Sit spot is a wonderful way to just connect with where you live, wherever that happens to be. Jen: 16:21 Okay, so I should try it then, is what you’re saying. Dr. Sampson: 16:25 You should. Definitely. Jen: 16:25 Okay. So let’s backtrack a little bit because I think the idea of sitting outside for 20 minutes and observing on a very regular basis may be potentially intimidating to some people. So let’s kind of backtrack to how a lot of people take their kids outside, which is with playgrounds. You know, they take children to a playground and they often have things like a climbing frame and monkey bars and a slide and you talk about how these places are actually not that great in terms of supporting children’s development. What’s so wrong with them and what are some better alternatives? Dr. Sampson: 16:58 Yeah. I mentioned this a moment ago but basically it’s the research suggests that kids playing on metal and plastic playgrounds with monkey bars and swings, teeter totters and all of that, that they are more prone to injury than in green schoolyards, and I’ll describe what that means in a minute. They don’t collaborate as much. They don’t play as long. They don’t interact with each other as well either during or after the play, so there’s all kinds of evidence to suggest that these sort of sterile environments are not the best and when you think about it, playgrounds are set up where the adults have invented the play activity. It’s climbing on a bar and swing on a swing. Whatever it might be. It doesn’t promote unstructured free play, which is what kids, especially young kids really need. It’s what their brains need when they’re using their imaginations and they’re making up stories and rules and interacting with each other, and those metal and plastic playgrounds really don’t promote that. Whereas green playgrounds really promote this use of imagination and creativity and a green playground is really just logs and boulders and grass and bushes and maybe some water and mud, things like that. They can be extremely simple but really effective and the kids might find sticks and use them to create games, forts, things like that. So it’s about providing children with raw materials that spark their imaginations in ways that a standard playground rarely does or at least not in the same way. Jen: 18:41 Okay. And so I’m wondering actually if we can talk a bit about how children use those things and how they use them as toys and we’ve…it’s January, late January as we’re recording this, we’ve just missed the major gift giving holidays and the Western calendar. So can you make us feel guilty about the hottest nature based toys that we might have failed to buy for our children? So where can we find these toys so that our children don’t grow up deprived of these essential experiences? Dr. Sampson: 19:08 Well what I write about in How to Raise a Wild Child is that we’ve got it totally wrong when it comes to toys. We think that, you know, Barbie dolls and GI Joes and super heroes are the way to go often, and it turns out that once again, these are not the toys that spark children’s imaginations because a Barbie doll or GI Joe is just that. It’s a little human being that has certain characteristics and you use it that way. Prior to writing this book, I had no idea that there was such thing as a National Hoy hall of Fame. Jen: 19:47 I didn’t know that until this very moment. Dr. Sampson: 19:50 But there IS such a thing and the number one toy in the national toy hall of fame is a stick. Dr. Sampson: 19:59 And the reason, of course. I mean it’s obvious when you think about it because the stick can be almost anything. A stick can be something like a cane. It can be a light saber or a sword. It can be something to pull something down or point something out. You can build with sticks. You can do an infinite number of things with them. Now compare that to a Barbie doll. You know, there’s no comparison. So the thing about nature that’s so powerful is in is full of loose parts, not just sticks, rocks and pine cones and dirt and sand and various branches. And whatever it might be that kids can use that they can apply their imaginations to invent, an infinite number of games with, and that’s where nature play just blows away most indoor play because most indoor play is scripted in the sense of having toys that are limited in what they can be used for. Jen: 21:03 OK. I’m wondering what you think is the appropriate balance of technology in nature because it seems to me that a lot of technology tools follow that really scripted mindset. They’re created by adults. They have one way of interacting with them, by and large, there may be exceptions where you can build certain things, but somebody else has done the determining of what can be built. So is there a time and a place where technology should and could be used in the outdoors and where do you draw this line and why? Dr. Sampson: 21:32 That’s a great question and I am significantly older than you are, Jen. I’m quite confident of that and when I grew up, the amount of technology in my life was minimal. And in contrast, the amount of outdoor time and nature time, my life was very high within the space of a single generation that has been totally reversed. So the average American child today spends on the order of seven to 10 hours a day looking at screens and about seven minutes playing outdoors, which is on the order of 90 percent less outdoor time than their parents had. So we’ve gone from having high nature low technology to the reverse, low nature high technology. So what I’m arguing in this book is not to unplug completely and get rid of technology, but rather to bring the two back into balance. So I firmly believe there is a place for technology in connecting kids with nature. Dr. Sampson: 22:29 And I write about this in the book, one of the techniques that we use as Geocaching, which is basically an outdoor treasure hunt. And if you do that in nature and there’s lots of natural places, you’re out with your kids exploring and going on a treasure hunt. So there’s a great way to use technology, to find things in nature. There’s a growing number of apps that you can get to identify birds and insects and plants and rocks and stars and all these things that you find out in nature and if you get really hooked, you can download an app called iNaturalist which will allow you to observe a bird say or a mammal. Take a picture of it and upload that to iNaturalist, and that becomes part of a body of scientific data that researchers use to answer all kinds of questions. Dr. Sampson: 23:20 And just to give you one example, observations of birds that people make in their own backyard go into a database which are helping researchers to determine the influence of global warming on bird migration. That is, as the planet warms up, birds return earlier and leave later every year. So it’s this kind of backyard data that anybody can add to that’s helping advance the science. So I think there’s lots of ways that we can use technology to help connect kids with nature. And we also need to unplug way more than we do and let kids open their senses and be unplugged out in nature so that they can truly experience it because if they are looking at screens, they’re using that very directed kind of attention versus the lantern kind of attention. So they don’t see…they’ll tend not to see what’s going on, but you know, even taking pictures or video of nature is a great thing to encourage kids to do because it’ll allow them to look for things in a new way. We just have to make sure that we balance it with time where those screens are turned off. Jen: 24:31 Yeah. It’s..What you’re saying strikes me as reminiscent of a sort of a tool that we’ve been using. I hate to call it a rule. It’s sort of becoming a rule in our house where we don’t interact with technology for the sake of interacting with technology. We do it as a tool, so if my daughter has a question or she’s interested in something and that’s best answered through watching a video, then we watch a video on YouTube of yesterday. It was how a snake eats and alligator that she was fascinated by. Yeah, she has no fear of death or any horror around that or anything. She was totally into it and your mileage may vary, other parents who are listening, so definitely use this according to your own child’s preferences, but the key is not to have the interaction with the technology be the goal in itself. The goal is to help you answer the question and so I think I actually read your book shortly before we went on vacation to Hawaii and I love to hike, but hiking out there is very difficult for young children because it’s always wet and slippery and it’s just not a great first hiking experience and so we actually ended up, based on what I’d read in your book, doing a bunch of Geocaching and I was sort of torn – my daughter really loved it. She totally loved getting outside and finding the treasure and of course we would explore the nearest beach afterwards so we would get to find out the new places. Personally, I felt as though I was the one who, you know, my face was glued to the phone going, are we walking closer to or further away? So I found that, you know, I was torn as to is this a good thing or a bad thing, but she was very into it and you know, isn’t quite there in terms of relating the map to what’s on the ground yet and I think that will come but, but again, it’s using a tool to get outside and explore nature in a different way than we otherwise would have done. So I found that pretty cool. Dr. Sampson: 26:21 Very cool. Good for you for experimenting. Jen: 26:25 Thanks. So I am thinking about why parents might struggle with this and one of the things that comes to mind is the fact that maybe they didn’t do it themselves as much as children or maybe they never learned to how nature works or they don’t remember anything from their biology or ecology classes that seemed like decades ago. And you know, maybe their child asks them a question and they just don’t know how to respond. They don’t know what the answer is. And that makes them feel uncomfortable. What suggestions do you have for parents who find themselves in this boat? Dr. Sampson: 26:56 Three simple tips, and I use an acronym, the word new, NEW. Notice. Engage, and Wonder. So the first step is simply to notice nature and get your kids noticing it so because they follow our lead and if you don’t value the natural world and there’s little chance that they will. So just create a habit. Even if you’re not willing to do a sit spot thing. All of us can afford to walk outside first thing in the morning and spend 30 seconds just taking in what’s happening? What can you hear? What are the clouds look like? What kind of weather’s rolling in? What do you see out there? And if you do that, kids will be more likely to do it and just get kids noticing what’s around them. The big things, the small things, the medium sized animals. One powerful ideas just to take kids around the block at night because they can..it’s just another way of experiencing the world. Dr. Sampson: 27:49 That’s exciting, especially when you’re young. If assuming it’s safe to do that where you live, so that’s known as engage is all about this full body engagement that we need to have with nature. Too often these days we tell kids, no, no, don’t climb that tree. Don’t throw that rock. Don’t pick up that stick and the reality is that nature connection is a full contact sport that you got to engage bodily and both kids and nature can take it. Now, I’m not arguing that we should turn over our national parks to hordes of rampaging kids, but we actually do need to let kids go off trail in these places that we’re shooting ourselves in the foot because the decision to protect certain areas because of their natural beauty is made by every generation independently and what we’re seeing in the U.S. Right now is that that value is not being upheld and we’re losing public lands in some cases. Dr. Sampson: 28:45 So unless people engage bodily with these places, they’re not going to form that emotional attachment and they’re not going to act on behalf of those places later in life. So that full body engagement is really important. Let kids play and give them the distance to do it. Don’t be hovering around them all the time. Instead of being a helicopter parent, work on being what one woman blogger called a hummingbird parent, and I love this. It’s just stay as far away as you can, but zoom in so that the child is comfortable but zoom in when necessary so when they’re infants, you’re going to be just a step away the most as they get older and take steps back and give them the space that they need to grow and become autonomous. So that’s engaged in N and E and the W is wonder and that’s all about really invoking this sense of wonder and there’s lots of different to do it, but just spending time outside and beautiful places can be one of those things. Sharing amazing ideas and stories can be another. Jen: 29:51 Okay. So I was really interested in your chapter on the power of story because I have already started researching a podcast episode on storytelling and so the two kind of came together when I read that chapter and there are some cultures where oral histories and storytelling are really prized. But in Western cultures we sort of seem to see book learning as superior to other methods of learning. Can you tell us some more about how storytelling can connect us with nature? Dr. Sampson: 30:18 Yeah. Two big ways. One is the stories that we tell children and those of us who did grow up with a free range outdoor childhood stories about what it was like out there and telling kids these stories can get them excited and want to go and do these things. Whether it was waiting into a pond or catching a lizard or whatever it might be. But the other is pulling stories from kids when they go outside and come back in, ask them, well what happened? And at first time any kind of narrative around it. But if you asked them enough questions, they will create a narrative and you can turn what might be an easily forgettable afternoon playing outside into something they remember the rest of their lives. And just to give you one quick example, I was with my daughter. I write about this in the book and I was walking with her one day when she was about eight years old and we saw a great blue heron there in California, Marin county. Dr. Sampson: 31:17 And she said, Daddy, what’s that bird? And I love herons. And it took everything in my power not to tell her not only and the common name but the scientific name as well. But on this day I held myself back and I said, I don’t know, what do you think? And she said, I think it might be a heron. And then I said, well why don’t we sit here and watch it? And so we did. And I said, well gee, what do you think the heron’s doing? She said, I think it’s hurting. And I said, what do you think it’s hunting for? And she said, I think it’s tempting for rodents and sure enough, like it was almost on cue, this amazing, huge adult, great blue heron, did this slow zen-like bow and then stabbed the ground suddenly with its beak and came up with a rodent and it tilted his head up and we could literally watch this animal going down the gullet into the stomach of this bird. And Jade was like, wow, that is awesome. Dr. Sampson: 32:13 We sat there and we watched this heroin deplete the field of rodents. And we left after that and she was bubbling about it the whole time and creating this whole story around it. We got home, she pulled out a bird book and she’s came running to me and said, Daddy, that was a great blue heron. And to this day she still remembers it. And so one of the lessons from this is the questions are often, in fact typically more powerful than answers. And when children ask us questions, they often don’t really want us to tell them the answer. They just want us to engage with them. And in fact, they would rather be the expert in some ways if it were possible. It’s one of the reasons kids love dinosaurs. It’s one of the first times in their lives that they often know things that the grownups don’t know. Memorizing all these multisyllabic names, but asking kids questions, pulling these narratives on is a great way to engage them in the power of story. Jen: 33:08 And it goes back to the idea of, okay, if I’m a parent who doesn’t do the outdoors, it takes so much of the pressure off, right? Because any parent can ask a question. Not any parent can be an ecologist, but any parent can ask a question about what their child’s experiencing. Dr. Sampson: 33:22 Right? And that’s a terrific lesson. Thank you for bringing that up. The reality is not only do you not need to be an expert, you don’t need to know anything to take your kids out in nature. The key is to be a co-explorer where you’re going out and you’re developing this sense of curiosity with them and just asking questions with them and then looking for what they’re interested in and then helping them find the answers that they’re most curious about. Jen: 33:49 Okay, alright, so let’s take this to the next level. So I like to be outside, obviously. Last winter, my daughter and I spent a fair bit of time exploring streams and it wasn’t really a conscious decision I made, but it was more know hiking isn’t so much fun in the rain and sitting in a stream actually can be kind of can be fun in the rain. But after I read your book I decided to take it up a notch and I emailed a bunch of families that we know and I said, please let me know if you’d like to be on an email list that I send messages out to when I’m planning some kind of nature-based outing with my daughter. And so several people responded and a few months ago, I think it was November actually, we went out and I got some pond dipping nets and some and little plastic magnifying boxes and just for preschool has got absolutely soaked and filthy dipping in our local pond. Jen: 34:37 It was, it was a huge hit with parents and children alike. And so in a couple of weeks we’re actually going out to Point Reyes national seashore and we booked the entire hostel, and so we’re going to go and do some estuary dipping and some unstructured playtime on the beach. And so I’m sort of aiming for about a monthly cadence of, you know, sometimes the more lower key local, sometimes the more involved, but I’m kind of a planner and so I really liked doing this stuff, but I know that not everybody wants to be the monitor of an email list. So is there some other way that parents can sort of help this process along, get beyond the, you know, “I know nothing” phase into the next level, but maybe they don’t want to be the holder of the email list like I am. Dr. Sampson: 35:26 Yeah. Well, you do take it to a higher level – that’s impressive! Jen: 35:30 Yeah, it was inspired by you! Dr. Sampson: 35:34 Point Reyes is one of my favorite places in the world. Jen: 35:35 And we should say to listeners that you actually lived in Marin County, so you’re familiar with the Bay Area. Dr. Sampson: 35:42 There’s this thing that I write about in the book called Family Nature Clubs and it didn’t even exist a number of years ago as a thing, as far as I know. They have popped up all over the country. The Children and Nature Network keeps track of, as far as I know, the bulk of family nature clubs on their website and you can go to that and there’ll be a link for that. But if you just do family nature club and then put in the name of your town or city, you can see if there is one in your area. And often there is and the idea is really simple. Even much simpler that you’ve taken it Jen, where it’s just like it’s at least two families that get together and do something outside and it can be as simple as going to the local park down the street and having the adults sit there in lawn chairs or have a barbecue or whatever while the kids run around and play. Dr. Sampson: 36:37 So you’re giving the kids this chance to have unstructured, free play outdoors and the adults get to have adult time, you know, which is terrific without the kids hanging out because the kids are out running around doing their own thing. So it’s a fun thing to do. Some groups, they do it on a weekly basis and will get together every weekend. Of course, not everybody makes it every weekend, but they know that if they want to, there’s something going on and it might be going to a natural history museum or going for a hike or sitting in a park or going stargazing at night, whatever it might be. But this notion of family nature clubs is often the simplest way to get you and your kids outside. And by the way, if you have kids who say, “I think nature is boring,” there’s nothing going on. Dr. Sampson: 37:25 You know, when I was a kid, I had the choice between staying and watching television on a Saturday or going outside in the neighborhood and playing kick the can. There was no choice. I was going to be outside every time. But I get it that if you’ve never had that experience than going outside, maybe boring. But the thing is if you have other kids there, it’s this gravitational pull for your kids as well and particularly, even if they’re teenagers, because teenagers have a worse, they go, oh my God, just shoot me. I don’t want to go and do all these things outside. But if they know that there’s other teams there as well, they may be much more prone to go. And for those that are more adventurous, you know, these family nature clubs, you can go skiing or boating or whatever it is to that you want to do. So the key is to find a place where adults and kids can get together and the adults are off in one place and the kids are off playing, doing their own thing on the other. Kids of preferably multiple ages. And that to me is one of the most potent and profound ideas that’s come out of the Children in Nature movement is these family nature clubs. Jen: 38:34 Yeah, we’ve definitely found having friends along to be really critical. On our first outing we, I hesitate to say hiked, but we walked I think a whole quarter mile to the lake and and I had done it a couple times previously with some whining and complaining about how far it was and how much her legs hurt, which is – frankly I don’t understand it because she can run around the playground 50 times and not have any issues with her legs whatsoever. But as soon as there’s a small group of friends involved to all of a sudden it’s much more exciting and she’s willing to walk with them and find snails on the trail and things that she wouldn’t necessarily do if it was just her and me. So it has definitely been a revelation for us. Dr. Sampson: 39:20 So a couple of things. First off, when it comes to kids, never, ever, ever, ever, ever call it a hike. Jen: 39:26 What do you call it then? Dr. Sampson: 39:28 An “adventure.” It’s an adventure. Believe me, I’ve taken my daughter on hikes and she is one of the people I know and we’re walking up the first hill and she’s going, my legs hurt. So I know I’ve heard that whole thing. But if you’re going on an adventure and it’s much better. The other thing is if you are going out on one of these hikes/adventures, don’t take the adult attitude of well we have to make it to the destination, whether it be the top of the mountain or the lake or whatever it is you’ve gotta go with the kids pace and find out what they’re interested in. You might distract them with things like how many different birds can you hear? Dr. Sampson: 40:05 And then they got to work at that as they’re walking along and you keep a count and you see who can count more or something. So you’ll get their minds going on something other than the fact that they’re walking up a hill, but the best way to do it exactly the way you mentioned, and that is they have other kids around, they don’t even care. That will be fine all day because they’re playing. So that’s powerful. I should mention another program for those listeners you have who might have infants. There is a wonderful program called Hike it Baby and Hike it Baby is started by this woman who is a power of nature who has got women all over North America now going out – and not just women I should say actually men as well with their babies and backpacks or whatever and going out and having adventures together. So the earlier you start with kids the better and programs like Hike it Baby are a great way to do that. Jen: 40:58 Yeah. And just to brainstorm for a couple of minutes on potential resources. You lived because you were living in the Bay Area around the time you were writing this book. A lot of the suggestions that were in the book about places to connect were actually really relevant to me right down the street from my house, but that’s not the case for people who are reading it in other places and so one place that I found resources that I wasn’t expecting to find them was on Facebook and I actually found that my local park doesn’t post a lot of information at all on Facebook, but there’s a park a couple towns over that their naturalists seemed to run interpretive programs at parks all over the East Bay, which is close to San Francisco. And so if it hadn’t been for you kind of prompting me to look for those groups, I wouldn’t have made those couple of extra steps and we’ve actually gone on one or two of their outings and they’ve been really great. Are there other resources that parents who don’t live in the Bay Area may find that I might not have considered? Dr. Sampson: 41:58 Yeah. And they’re growing all the time. So once again, Children and Nature Network can often be a great place to start believing have listings of places to go and particular areas. That’s a great website. I think nature centers are a terrific place to because A, they know about the nature of that lives there and where you can see it and B, they know the best places to go and which ones are kid friendly and which ones aren’t, etc. Otherwise you might try things like natural history museums. They’re Often pretty in tune to what’s out there and what you can do and they often even have outings that you can do with kids. In Vancouver where I’m living now, there’s a number of groups. There’s an ecological society that takes you out walking. Many cities have nature walks where they’ll just take families walking around the city and show them what nature is there in the neighborhoods, so even if you just do things like once again a search on nature or nature walk and your city, you will find resources that you probably didn’t know exist. Everywhere I’ve lived I kept discovering more and more. I was in Denver just prior to coming up to Vancouver and every week I found out about a new organization that was really pushing to get kids out in nature somehow. So they’re out there. Jen: 43:20 Okay, super. Well, thank you so much for sharing your time with us and giving us so many practical ways that we can help to get our kids outside and for helping us to understand why that’s important as well. Dr. Sampson: 43:31 Jen it’s my pleasure and I want to thank you for having me on and for pushing this issue and for helping parents figure out ways to build even happier, healthier families. Jen: 43:42 So Scott’s book, How to Raise a Wild Child: The art and science of falling in love with nature can be purchased at local bookstores or on Amazon. And all the references for today’s show can be found at YourParentingMojo.com/WildChild. Hi Jenn, such a great episode! One question I had while listening was about the value of outdoor free play in a place like a yard. My kids spend a lot of time outside in the yard, which I’ve manufactured to be kid friendly– a slide, a trampoline, sandbox, plenty of outdoor toys. It’s a safe enclosed space where I feel comfortable leaving them unsupervised. I know this sort of unsupervised self-directed play has tons of value, but I’m wondering about the hierarchy of backyard play in the “wild child” outdoor-focused framework. In some respects it’s reminiscent of the playground which you mentioned as being less ideal as an outdoor space. In other ways it’s a familiar outdoor space with a bit of a garden where we watch birds and clouds and bugs and plants as they grow and change through the seasons, amidst the trampoline and bulldozer play. Do you have any hunches about the quality of this space vs. more naturalized spaces? Hi Sarah – I think both kinds of outdoor time have value, in different ways. It’s awesome that you feel comfortable leaving your children in the back yard unsupervised – they need that time to create their own games, come up with their own rules, and sort out their disagreements. (You might also consider adding some “loose parts” – toys that can be played with in many ways – like buckets, planks of wood, tree stumps, guttering, and perhaps even a hose (with a flow regulator that you control at the tap)). They will get different things from being “in the wilderness” (which, we should acknowledge, isn’t really wilderness any more) – how to evaluate risks in new places; how to put information they learned about the habits of the birds that live in your garden into practice elsewhere; how to navigate, etc. So I don’t see this as either/or, but rather both/and.